Looking for a SEO specialist? We are EHD. A trusted SEO agency based in Shoreditch, London. We have years of experience and an excellent track record in delivering SEO campaigns that deliver results. Despite the SEO landscape dramatically changing over the last few years, our campaigns continue to deliver returns to the many brands who trust us with their online marketing. Why? Well instead of chasing rankings, we take a more holistic approach that focuses on real marketing; ensuring your website is technically sound and optimised; that there is interesting and valuable content being shared about your brand; and that your audience is engaging with your content, both on your website and elsewhere on the web. The result is greater online visibility and higher levels of brand engagement – both through higher rankings on search engines and increased PR across authoritative sites. Our in-house Search Marketing team includes technical SEO specialists, creative content generators and outreach experts. Every client benefits from a dedicated Account Manager who will continually work with you and support your campaigns – ensuring campaign objectives are met, any new opportunities are identified and that you are always kept up to date on campaign performance through regular and clear reporting. We conduct a series of insight and analysis reports to understand your unique SEO profile. We look at your consumers to understand what they are searching for online, what they are interested in and where they hang out online. We assess the performance of your competitors to understand what’s working for them and what isn’t, in order to build a picture of what we need to do to beat them. 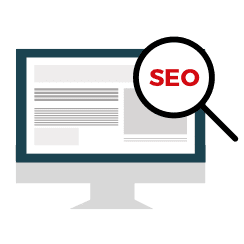 Our technical team will then carry out a full audit of your website to identify any technical factors that may impact the ease with which search engines can read and index your website. At this stage we also ensure the website meta data is optimised and we adjust content and site structure where necessary. We also review your backlink profile to ensure your site is not being penalised and where necessary we will clean up your inbound links. Finally, we identify any usability issues to ensure the website is highly engaging and user friendly so that visitors enjoy using the site, and want to share the site and keep coming back. Ultimately, a technically sound and engaging website forms the foundation of any successful SEO campaign. Our next goal is to raise your profile online. We carefully plan a content strategy that will engage your audience online and support your SEO objectives. This is where creative thinking meets technical prowess to create well optimised, interesting, valuable and engaging content pieces. Through an established network of influential journalists and bloggers we promote your content and your brand. We have contacts across a range of sectors and we are building new relationships all the time. It really is modern day PR. Your Account Manager will continually be analysing and interpreting campaign performance metrics and regularly reporting back any campaign trends such as key wins and areas for improvement. We don’t believe you should need a degree in search marketing and statistical analysis to be able to understand your agency reports so we send our clients monthly reports with clear written commentary in plain English.